Eitan and Naama Henkin who were murdered in front of their 4 children yesterday. 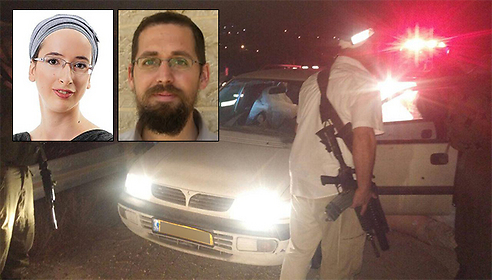 Yesterday, an Israeli mother and father were gunned down in front of their children after their car was stopped by terrorists in the West Bank. Today, in Jerusalem, a Palestinian terrorist stabbed 4 Israelis, killing two of them. My deepest sympathies with the families of the victims. These people are my compatriots. My flesh and blood. My family. Enclosed is a mourner’s prayer in Hebrew. Building more settlements and destroying the homes of the families of the terrorists in order to avenge the recent killings? NO!!!! A thousand times NO! I want the perpetrators and those who helped them to be brought to justice and for them to face life in prison. No mercy. But leave their families. And lets not punish the entire Palestinian population by building more settlements. And Mr Abbas: I am disgusted by your refusal so far to condemn the recent killings. Shame on you.